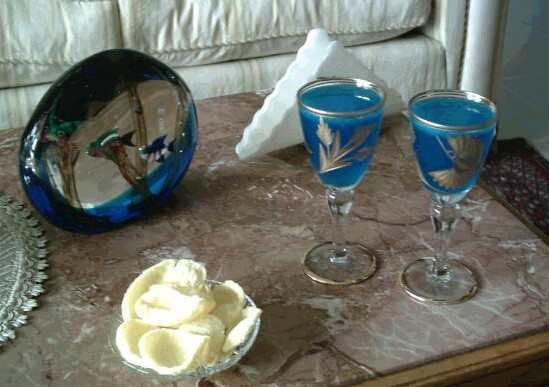 In a sparkling clean shaker pour 2 cl of lemon juice, 2 cl of Blue Curacao and 2 cl of vodka (or gin) for each attending people. Add ice cubes and shake well. Align a sparkling clean cristal thumble for each people attending the cocktail. Put half a slice of fresh fruit into each glass. Pour the cocktail into each glass and serve. Blue lagoon can be served with varied tartines: butter and anchovies, maionnaise and shrimps, butter and caviar. A merry low volume background music completes your cocktail.